Soma is a game utterly devoid of bells and whistles. There are no fancy graphics, flashy characters, or complex controls. The look is stark, the first-person gameplay simple and linear. What Soma does offer, however, is something much more unusual: a genuinely thought-provoking experience. On the surface it’s a sci-fi take on survival horror but underneath that it’s a game unafraid to tackle the large existential questions, challenging the player to consider what it is to be human and what exactly makes a life worth living. Developed by Frictional Games, Soma is fairly straightforward in terms of gameplay. You play as Simon Jarrett, young man who has agreed to an experimental brain scan in hopes of developing a better course of treatment for injuries sustained in a car accident. After blacking out during the scan he wakes up nearly a century later in an underwater research facility, one of a chain of stations collectively known as PATHOS-2. He quickly discovers that all surface life has been wiped out after a comet collided with Earth, and from there two distinct plotlines emerge. The first is the quest to save the remnants of humanity housed in the mysterious ARK developed by scientist Catherine, whose scanned consciousness guides you via your Omni-Tool. The second plot point? That would be the hostile robots and bio-mechanical monsters trying to kill you. The core of Soma, the artificially beating heart if you will, isn’t necessarily the story itself but rather the questions it raises. One of the main issues at hand throughout is defining what it is to be human, and what it means to be alive at all. If your exact consciousness was transferred to a new body, or some other new form entirely, would you still be you? Can someone whose mind was now housed in a robotic body still consider himself to be human, or to be alive at all? If a person were to be copied, perhaps multiple times, which would be the “real” one? Does the “real” person, the original life, cease to exist once the consciousness leaves the original body behind? The obvious parallel to these questions revolves around redefining death - if you could transfer your mind over and over, would it be possible to skirt death altogether? At what point would a person rather embrace death than accept an entirely new kind of existence? One of the most interesting thoughts that Soma gives the player to gnaw on is the extent to which one’s personality and sense of self is linked to and defined by the environment in which we live. If you suddenly found yourself in an entirely new place and time, if your life was now lived out in an whole new context, would you still be you? From protagonist Simon’s perspective self-perception is intrinsically linked to one’s sense of place. Once he becomes unmoored from all of the external influences that made up his old life he faces a crisis of identity, unable to fathom an existence in a foreign environment in which he seemingly has no place. Wonderfully, Soma makes no attempt to answer any of these questions. Simon and Catherine each have their own perspective, the player will inevitably come to their own conclusions, but at no point does the game propose that there are any “right” answers. In the tradition of the many great sci-fi stories that preceded it, Soma presents a world in which the technology we build and enable may someday force us to reconsider our beliefs about what it means to be alive, and whether a life can truly transcend the conventional definition of death. 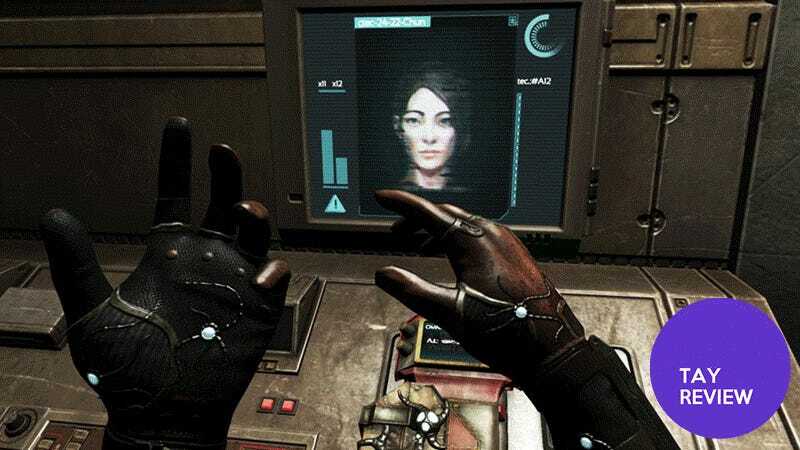 In terms of gameplay Soma is a mix of conventionality and novel flourishes. The first-person gameplay is almost entirely linear and the controls, which could fairly be described along the lines of “point-and-click,” require little skill to master. There are no weapons or armor; when you encounter something hostile your only options are to either sneak past or skulk away and hide until it leaves. The look is appropriately dark and gloomy throughout, and the graphical quality isn’t particularly impressive in comparison to most other current games. An admittedly very minor annoyance is the way the game tends to freeze for a few seconds at autosave points, and the length of time it takes to start up initially. However, there are a number of small touches that add greatly to the overall atmosphere. Whenever an enemy is near your screen increasingly “glitches” the closer you get to it, and darkens and blurs when you’re injured. Healing yourself via reasonably spaced-out pods returns your character’s visual field to normal, a neat touch that happens to fit perfectly with the story and setting. Soma also uses sound to great effect. Your character, Simon, only speaks occasionally so that the majority of the game is composed of silence accentuated only by ambient sounds and the occasional pant or gasp reflecting your character’s actions. Music is used sparingly to heighten only the most suspenseful moments, and as a result it’s incredibly jarring and effective when you suddenly hear the mechanical howl of an unseen monster blaring out of nowhere. Soma is very deliberately paced to allow the story to unfold slowly over the course of the game. You find clues as to what happened by carefully exploring each station; there are no collectables per se but each photo, note, and email provides a small window into exactly how the events of the past played out. It’s entirely possible to storm through the main objectives and miss many of these small details, but it’s these tiny clues that make the PATHOS-2 stations feel like real places that were once inhabited by real people. Unfortunately most of the environments are incredibly similar so there were more than a few points where the exploration felt rote instead of revelatory. The station → sea floor → station → sea floor pattern, improbably enough based on the description, felt almost boring after a certain point. I’m not sure what that solution to that would have been - significantly varying environments might not have fit with the setting of the story, and an accelerated pace might not have been as suspenseful - but the overarching structure of the levels ended up being more than a bit predictable. At the outset, the mysterious circumstances you find yourself in seem to be aspects of a single overarching mystery that Simon must unravel. Oddly, as the game goes on the two main elements - finding the ARK and figuring out the source of PATHOS-2’s bio-mechanical monstrosities - appear to be entirely separate stories that just happened to grow out of the same precipitating event. Granted, Simon experiences both simultaneously - you’re dodging robots and monsters more or less continuously as you trek toward the ARK - but the two elements never really mesh together story-wise. Nowhere is this more apparent than at the end of the game. A short time after the monster story is resolved Catherine asks Simon what happened, he tells her, and she could not be any less interested. (If I recall correctly, her exact response is “ooookayyy let’s just get back to work.”) For a game primarily marketed as survival horror it seems strange that the “horror” part ends up feeling totally secondary. This isn’t to say that either of the two plotlines are by any means bad, it’s just that the game as a whole ultimately feels a bit disjointed in terms of story. At a mere 10-12 hours long, there’s no reason not to give Soma a shot. The main story may not be as cohesive as it could have been and the gameplay isn’t exactly groundbreaking, but the overall experience that the game delivers is well worth the effort. Beyond the typical jump-scares and tension found in your average survival horror game, Soma challenges the player to think about issues much larger than sneaking around the next monster or finding the key to that last door. Whether you’re the type of gamer who’s in any way open to the concept of games as a means to imagining possible future realities or are simply a fan of survival horror in general, Soma is a worthwhile entry into the genre. Nicole T (street name: Barkspawn) lives in California and knows there’s a really great Sealab joke to be made in here somewhere. You can find her on Twitter @ser_barkspawn, contact her here, and read more of her articles here.